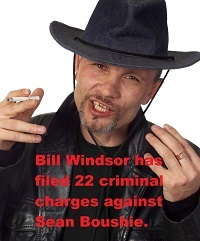 On May 27, 2015, William M. Windsor filed 22 criminal charges against Sean Boushie with the Missoula Police Department and the Missoula County Attorney's Office. I request a meeting with Detective Chris Shermer to present my criminal charges against Sean B**shie for false swearing, perjury, and false statements to the police. I have detailed 22 counts. Verizon: Subpoena all information about Sean B**shie's cell phone. Most of the emails were sent from a Blackberry using Verizon. Boushie has a Blackberry. If they by any chance have records of his emails, bingo. Maybe they at least can say that Verizon would have picked up the IP addresses that were repeatedly used in Boushie's emails. Neither Crystal Cox nor I have had a Blackberry, and we weren't in this area. Verizon: Subpoena all information for my number, 770-578-1094. If they still have records of calls for 2012 and 2013, they will show that I never called Boushie. University of Montana: Obtain information for these University of Montana IP addresses that Crystal Cox and I have captured on emails from Sean B**shie: 150.131.72.190 (2-27-2010 at 3:15 pm); 150.131.65.113 (9-13-2012 at 9:03 am and again at 12:38 pm and again at 1:34 pm); 150.131.64.81 (1-17-2013 at 2:24 pm); 150.131.76.3 (2-15-13). Confirm with your IT gurus that there is no way to send an email from a University of Montana computer without being at the University of Montana. Neither Crystal Cox nor I were ever there. Call (my ex-wife) at 404-###-#### and confirm that I did not have a gun in Montana in August 2013 because it was in her home from April 2013 until December 6, 2013. Obtain registration information for www.victimsclassactiongroup.com. This was a website operated by Sean B**shie to attack Crystal Cox. Subpoena information for Sean B**shie's home telephone number that he claims he disconnected because of all the calls I made to him. What was the number? When was it disconnected? What was the telephone company told? Where are there 911 calls or other reports of this alleged activity? Request information from Sean B**shie: Ask Sean B**shie for evidence of the unsuspecting people that I emailed accusing them of harassment or crimes. Ask Sean B**shie for evidence of any frivolous legal action I ever filed with attempts to obtain legal settlements. Ask for evidence of the requests for legal settlements. Ask Sean B**shie for evidence that I took over Crystal Cox's list of victims and that I was hired to harass them. Do a forensic examination of my laptop. Confirm that I never faked any emails, etc. Review my polygraph examination results. This will confirm that I never knowingly or purposely did anything to violate a protective order. I never had a gun in Montana. I never did anything pretending to be Sean B**shie. You have me charged with five crimes, all of which were set up by the criminal acts of Sean B**shie. Unless some higher powers have told you to pursue these actions against me, you have a duty to confirm that Sean B**shie is the criminal. And, his crimes are much more serious than what you have charged me with. So, go arrest him. Detective Shermer, please let me know when I can come meet with you, obtain a police report number, etc. Thank you.